As youth development educators, we are always trying to find new ways to incorporate more “teachable moments” into our lessons to broaden the learning experience of our students. In addition, we are always trying to integrate science related activities (such as archery) back to S.T.E.M. This article does just that. 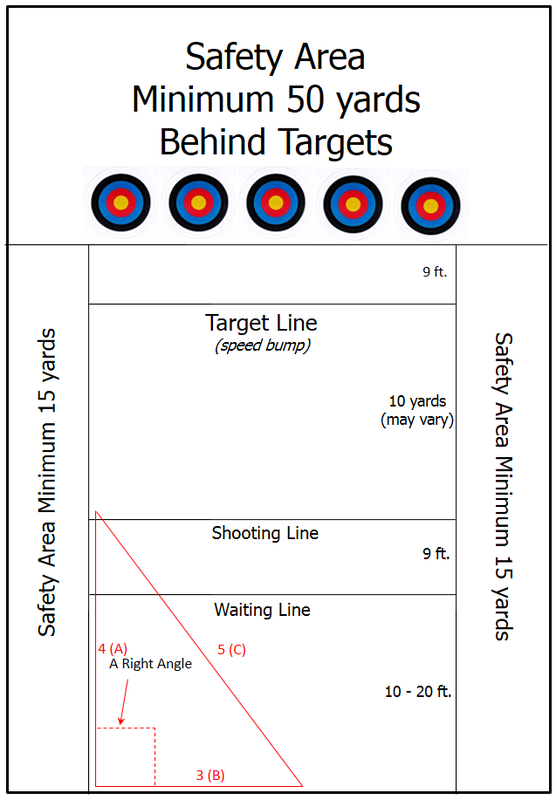 It uses a common building construction technique, the 3-4-5- rule of making something square, and relates it back to the topic at hand, in this case archery, and then highlights the underlying mathematics principle. I’d like to thank Dr. Mike Lindstrom, a Minnesota educator and S.T.E.M. 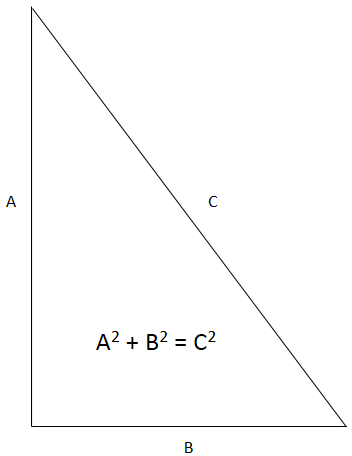 promoter for the technical explanation of the Pythagorean Theorem. Construction projects often need to have precise 90 degree or “square” angles. 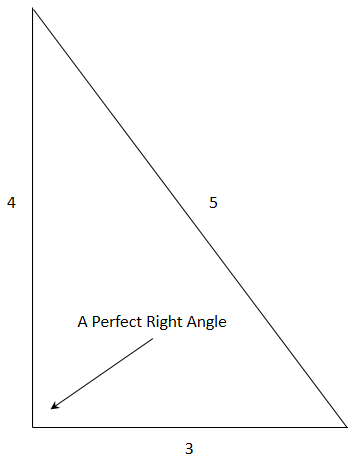 But often the available tools (such as a carpenter’s square) are simply too small to guarantee the accuracy needed for large projects such as laying out the foundation of a house; therefore carpenters, concrete framers, (and archery instructors) will often employ a 3-4-5 triangle technique to ensure accurate 90 degree angles. The technique simply requires that a person create a triangle in the corner of the lines that are to be square (90 degrees) to each other. The triangle must have one side (leg) that is 3 feet long, a second side that is 4 feet long and a third side that is 5 feet long. 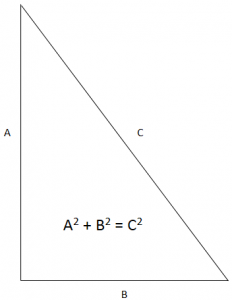 Any triangle with sides of 3, 4 and 5 feet will have a 90 degree angle opposite the 5 foot side. 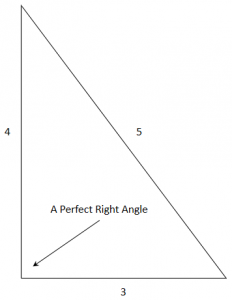 If a larger triangle is needed to increase accuracy of very large structures, any multiple of 3-4-5 could be used (such as a 6-8-10 foot triangle or a 9-12-15 foot triangle). 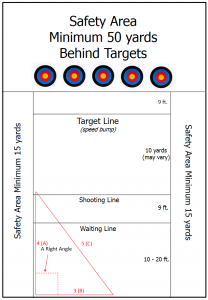 The purpose of this calculation is to layout a shooting range in a perfect right angle. A pre-marked 100-foot rope or 100 foot tape measure are tools for this purpose. Leg A is the yardage line marker, Leg B is the shooting line, and Leg is the hypotenuse. Ideally, Leg C would not exceed the overall length of the measuring tool. Use any one of the trio combinations below in laying out your range. Please note this word of caution, for large archery ranges not set up with this precision, it is easy to make it out of square by making simple measurements. That inaccuracy could result in giving one archer an advantage over another, if the targets are at differing distances from the shooting line. • Dr. Mike Lindstrom, Link to the original article. Raised in Texas, Gus graduated from Utah State Univ. , where he also served as the Principal Research Tech.